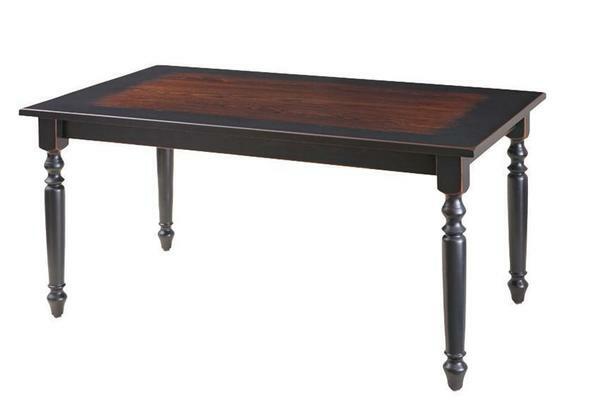 Add some charm to your dining area with our Amish handcrafted pine farmhouse kitchen table. This Farmhouse Kitchen Table offers you both style and quality Amish Old World construction to withstand many family meals, evenings of homework and Saturday craft days. Humble farm tables are the heart of the family. Farm tables have been around for hundreds of years often surrounded by long benches to seat large crowds. Farmers would come in from the harvest and gather around to share in their meal together. The table would serve a utilitarian purpose as a dining table but it was also where the meals were prepared, the bread was kneaded and the harvest was canned. Our farm tables and farmhouse tables look like these Colonial antiques but are handcrafted in Pennsylvania for each customer to your specifications. DutchCrafters proudly carries Amish Furniture and we are sure that our solid pine wood Farmhouse Dining Table is the best choice for your kitchen. Create a warm setting in your kitchen or dining room with a Farmhouse Amish table for the family to gather around. We offer a wide variety of country kitchen tables for your home so shop online, call us over the phone for help or visit us at our Amish furniture store in Sarasota, Florida. Browse our dining room chairs to complete the look. Heavy Distressing s an extensive amount of hand distressing to the furniture. There may be heavy pin holes, indentations and nicks, rasp markings and worm holes. The edges of the furniture are heavily worn. Simulated cracks are created on our heavily distressed package. You can notify your Amish furniture specialists if you prefer not to have the simulated cracks in the furniture.